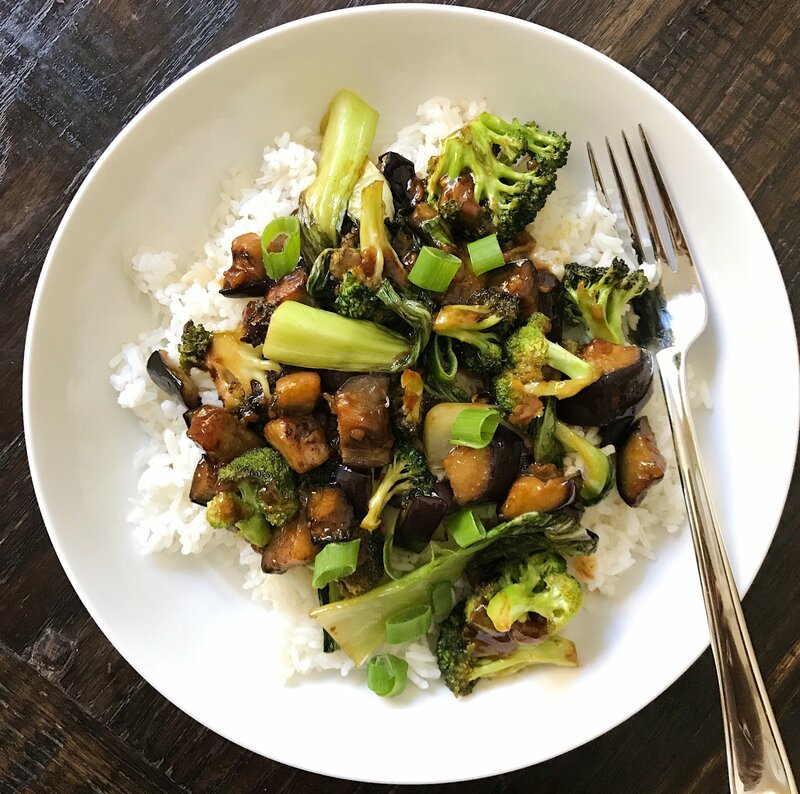 A gluten-free stir fry dinner that comes together quickly and offers something for everyone, making it a weekday win! When we don’t have a plan for dinner, we turn to a quick and easy stir fry. We have a few simple sauces we love like this Garlic Sauce or our General Tso’s Sauce which are easy to whip up. We just quick saute our favorite veggies or whatever we have in the fridge, make some rice if we don’t have any already made and stir fry some chicken for the boys. There is something for everyone which is always a weekday win! 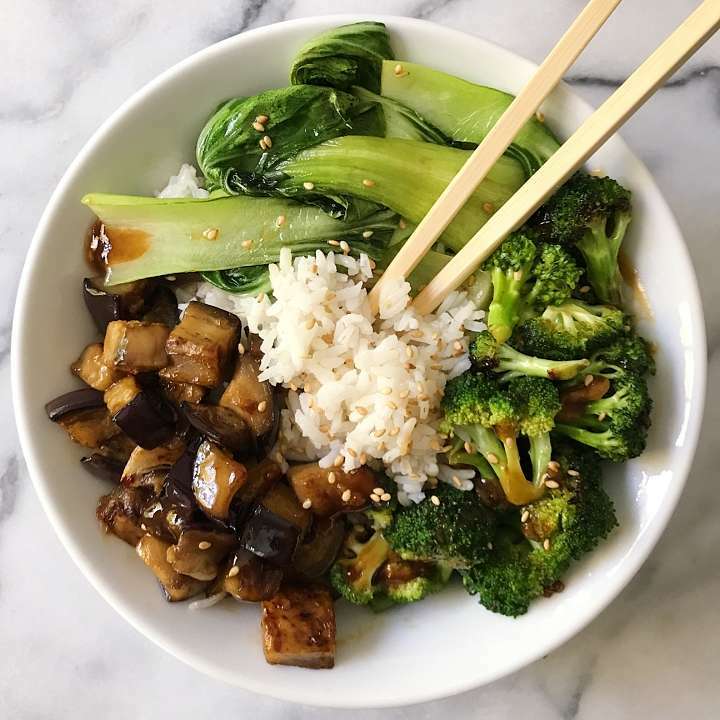 This bowl includes my family’s favorite stir fry veggies — eggplant, broccoli and bok choy plus Garlic Sauce. The garlic sauce recipe is adapted from The Spruce , takes less than 15 minutes to make and it is thick and perfectly flavored. It seriously tastes just like the restaurants. A quick, easy and super yummy dish in no time! 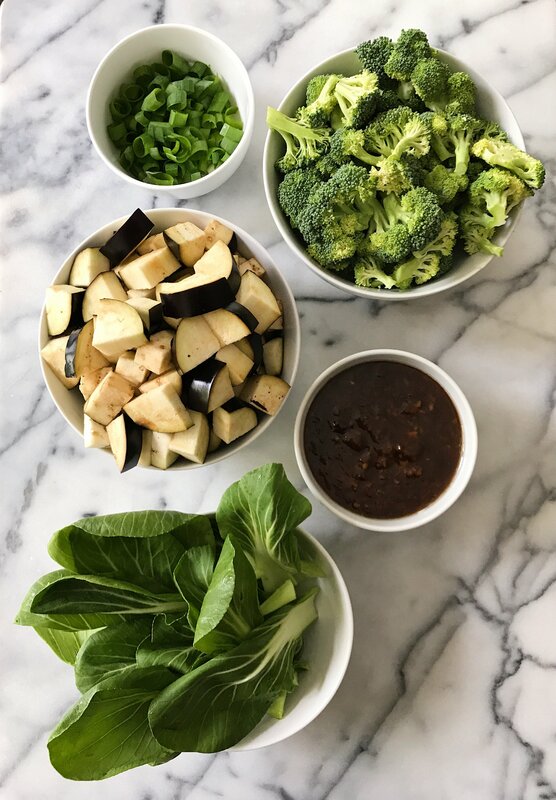 As with all my recipes, you can adapt to taste and substitute your favorite vegetables, add chicken like my boys like or tofu depending on your tastes or mood. As you can see by other photos with the same sauce, you can swap out the veggies like this one with all green veggies! Or you can stir fry them all together like the restaurants! No matter how you plate it or what veggies you choose, I hope you love it as much as we do! A easy, delicious dinner that's better than takeout! Garlic Sauce recipe adapted from The Spruce, it is the real deal and tastes just like the restaurants. It thickens quickly but thins a bit as it heats up again. 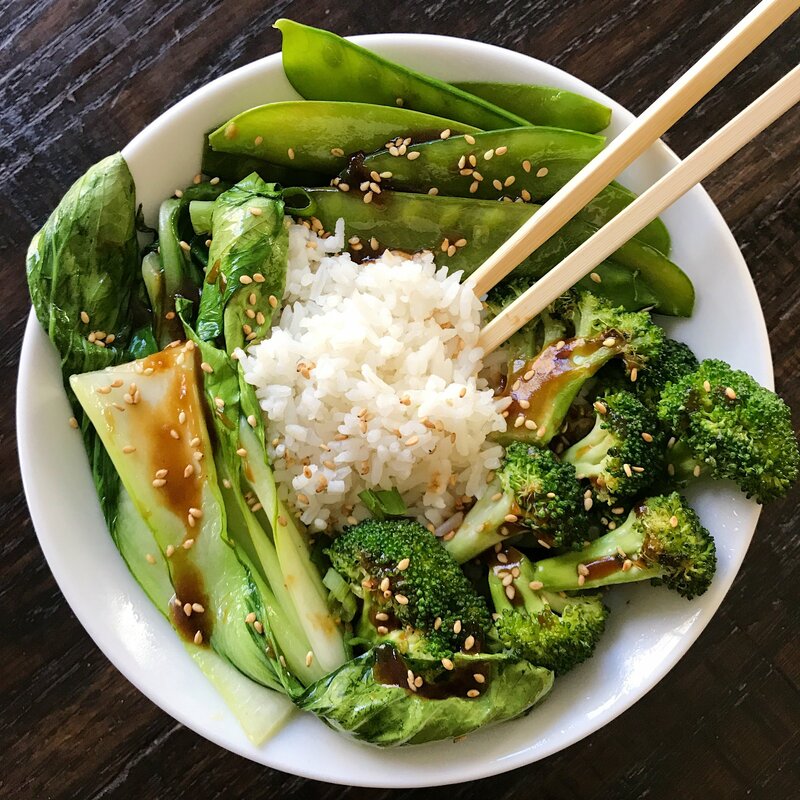 Combine rice vinegar, sugar, tamari, sherry, and ½ teaspoon sesame oil in a small bowl, stirring to combine. Heat 2 tbsp sesame oil over medium heat in a saucepan. Add the garlic and cook, stirring until fragrant (around 30 seconds). Re-stir the cornstarch- water mixture and add it* to the sauce, stirring to thicken. *Note, the sauce will be thick. My son prefers it when we use only part of the cornstarch water mixture --- start with 2 tablespoons of the cornstarch/ water mix and add more to your desired thickness. NOTE: To keep the veggies separate in this photo, I sautéed them each separately. First the eggplant, then set aside; then the broccoli, then set aside; then the bok choy. Then added the additional sauce on top of the veggie after plating them. Great substitutions! I best it tasted amazing!